William Nicholas Selig (March 14, 1864 – July 15, 1948) was a pioneer of the American motion picture industry. Selig was born and raised in Chicago in a Bohemian-Polish immigrant family. After starting as a furniture upholsterer, he worked as a vaudeville performer and produced a traveling minstrel show in San Francisco while still in his late teens. One of the actors was Bert Williams, who went on to become a leading African-American entertainer. In 1894, Selig saw Thomas Edison's Kinetoscope at an exhibition in Dallas, Texas. He returned to Chicago, opened a small photography studio and began investigating how he might make his own moving pictures without paying a patent fee to Edison's company. Selig reportedly found a metalworker who had unwittingly repaired a Lumière brothers motion picture camera and, with his help, developed a working system. In 1896, Selig founded the Selig Polyscope Company in Chicago, one of the first motion picture studios in America. He began making actuality shorts, travelogues and industrial films for Chicago businesses. In 1909, Selig was the first producer to expand filmmaking operations to the West Coast, where he set up studio facilities in the Edendale area of Los Angeles with director Francis Boggs. Southern California's weather allowed outdoor filming for most of the year and offered varied geography and settings which could stand in for far-flung locations around the world. Los Angeles also seemed to offer geographical isolation from Edison's Motion Picture Patents Company (MPPC), a cartel which Selig later reluctantly joined. The Sergeant, a Western short shot in Yosemite and produced and directed by Boggs for the Selig Polyscope Company was released in September 1910. Selig produced almost a thousand movies and was responsible for developing new film talent such as Roscoe Arbuckle along with early cowboy western stars Gilbert M. "Bronco Billy" Anderson and Tom Mix. He also popularized the cliffhanger format through the serial The Adventures of Kathlyn (1913). The Spoilers (1914), a western set in Alaska. is often cited as his greatest success. In 1915, the United States Supreme Court nullified all of Edison's MPPC patents, breaking the cartel and allowing increased competition. In 1916, Selig sued George Fabyan on the grounds that profits from forthcoming films of Shakespeare's works, along with a film on "The Life of Shakespeare", would be damaged by Fabyan's assertion that Francis Bacon was the real author of Shakespeare's work, a popular claim at the time. He had already obtained an injunction stopping the publication of a book by Fabyan on the subject, in which Fabyan promoted the discovery of ciphers in Shakespeare's plays, identified in his private laboratory Fabyan Villa. 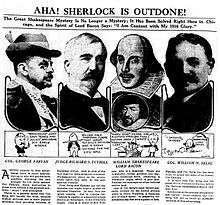 Selig was hoping to capitalize on the celebrations organized for the upcoming 300th anniversary of Shakespeare's death, scheduled for April 1916. A Cook County Circuit Court judge, Richard Tuthill, found against Shakespeare. He determined that the ciphers identified by Fabyan's analyst Elizabeth Wells Gallup were authentic and that Francis Bacon was therefore the author of the works. Damages of $5,000 were awarded to Fabyan for the interference with the publication of the book. In the ensuing uproar, Tuthill rescinded his decision, and another judge, Judge Frederick A. Smith, dismissed the ruling. It was later suggested by the press that the case was concocted by both parties for publicity, since Selig and Fabyan were known to be old friends. An official of the Selig Company was quoted as saying, about the initial loss of the case, "Isn't that sad. That will be about nine million columns of publicity, won't it?" At great expense, Selig created a zoo in East Los Angeles, stocked with hundreds of animals he had collected for his studio's jungle pictures and cliffhangers. He also moved his studio there. Meanwhile, World War I began cutting into profits from Selig Polyscope's extensive European operations and, as the war ended, the film industry moved towards more expensively produced full-length feature films. Under these circumstances, Selig Polyscope was unable to compete and closed in 1918. Nonetheless, Selig had great hopes for the zoo. Over thirty years before Walt Disney built Disneyland, Selig made plans to expand it into a major amusement park and resort called Selig Zoo Park, with many mechanical rides, a hotel, a large swimming area, theaters and restaurants, believing thousands of visitors a day would flock to the location. However, only a single carousel was ever built and the crowds never came. A business which ten years earlier had been one of the most prolific and widely known movie studios in the world had, in effect, become a struggling zoo on the other side of downtown Los Angeles from Hollywood's booming post-World War I film industry. Although for a time he was able to rent space on the lot for wild animal "location" shooting and other projects, this side of the business quickly dwindled into an animal rental service. Selig did some work as an independent producer and expedition promoter into the 1930s, but ultimately lost the zoo and his assets during the Great Depression. He then became a literary agent, re-selling story rights to film properties he had produced or acquired years before. William Selig died on July 15, 1948. His ashes were stored in the Hall of Memory Columbarium at the Chapel of the Pines Crematory in Los Angeles. For his contributions to the motion picture industry William Selig has a star on the Hollywood Walk of Fame at 6116 Hollywood Boulevard. In 1947 Selig and several other early movie producers and directors shared a special Academy Honorary Award to acknowledge their role in building the film industry. Wikimedia Commons has media related to William Nicholas Selig.